Tigers & Strawberries » Heirloom Tomatoes Are Here! Heirloom tomatoes are a hot topic in the food world these days, with writers generally trumpeting their virtues, though some folks, such as Derek from An Obsession With Food, have conducted taste tests of some varieties of heirloom tomato and have been both underwhelmed and blown away. What makes a tomato an heirloom? Well, they have to be from a variety that has been grown for at least fifty years, and it is most often preferred that they be open-pollinated. What does that mean? Well, that means that most heirlooms are not going to be hybrids–they are going to produce seeds that breed true. If you save seeds from open-pollinated tomatoes, you will grow a plant and harvest fruits that (barring natural mutation) have the same characteristics of the plant and fruit from which you harvested the seeds. Most modern garden vegetables are hybrid varieties, which means they are a cross-breed between two to four different varieties of the same plant. That means that if you were to save seeds from a hybrid tomato, for example, and then plant them the next year, you would not end up with plants or fruits that were like the ones you had the year before. You would get a plant with characteristics from one of the parent varieties that were cross-pollinated in order to produce the hybrid plant. Taste tests of heirloom tomatoes seem to be popular these days; Kendall Jackson winery holds a Tomato Festival every year that includes a tasting that is similar to the more familiar wine-tasting. At the winery tasting, tips on pairing wines with heirloom tomatoes are given, which interestingly, include matching the color of the wine to the tomatoes. One thing I should like to point out though, is that heirloom tomatoes, like all great tomatoes, are best grown locally and vine-ripened. Much of their flavor depends not only on the variety of tomato, but also on how the tomato plant was grown, how much rain or irrigation was given during different growth periods (dry farmed tomatoes–those given very little to no irrigration give -very- intensely flavored fruits, due to the minimal amount of water there is to dilute the flavor), and what type of soil it was grown in. I have seen heirloom tomatoes shipped to my local grocery store from Florida, and I would -never- buy one of them. Sure, they have the characteristic interesting shapes and colors, but I can tell by smelling them that they are just as flavorless as their perfectly round, red, baseball-textured Floridian cousins which are picked green and ripened on the truck with ethylene gas. In order to get a great heirloom tomato, you need to either grow it yourself, or buy it directly from a local grower. They need to be picked at peak ripeness, when they are fragile and unshippable, and they just about need to be eaten right away. Never refrigerate them–or any other good tomato, for that matter–because it takes away the flavor of the fruit. I always keep them at room temperature on my counter, and they keep for several days that way. This way, they are always at the peak of flavor and texture. I know a lot of people go on about how ugly heirloom tomatoes are, but I disagree. Perhaps it is because I didn’t grow up eating those perfectly spherical red, crispy, flavorless fruits, and instead ate homegrown beefsteaks which were always large, fluted and somewhat oddly shaped that I am not bothered by the shapes and colors of heirlooms. In fact, the genetic diversity that heirloom tomatoes represent with their rainbow colors and myriad shapes fascinates me, and I found myself first drawn to them years ago in Maryland, because they were beautiful to me. They looked like something out of a Dutch master’s still life; the deep violet-rubine of “Cherokee Purple” and the green-shouldered brown-russet burgundy shade of “Black Krim” attracted me right away, while the yellow and green striped “Green Zebras” tickled my sense of whimsy. Yellow and red flamed “German Striped” thrilled my eyes, while pink Brandywine looked anemic, but smelled so good I had to try it. I remember making a beeline for them at the Columbia, Maryland farmer’s market and buying up ten pounds of them, they all smelled so amazing, and looked so good. I took them home and did my own tasting and was amazed as the variable flavors. Brandywine was very tomatoey, even if it did look watermelon-pink, while Blak Krim was spicy and acidic. Green Zebra had a kicky acidic flavor, while German Striped was sweet as a tomato preserve, without having any sugar added to it. Cherokee Purple turned out to be a favorite, with its very careful balance between sugar and acid, with a slightly musky quality that was irresistable. That was the year I invented my Calico Salsa, which turned out to be the first way that Zak would willingly eat fresh tomatoes. Every year since then, I eagerly await the first heirlooms of the season, and each year, in addition to just eating them sliced on sandwiches, in salads and just as themselves, I add new recipes to let them shine. 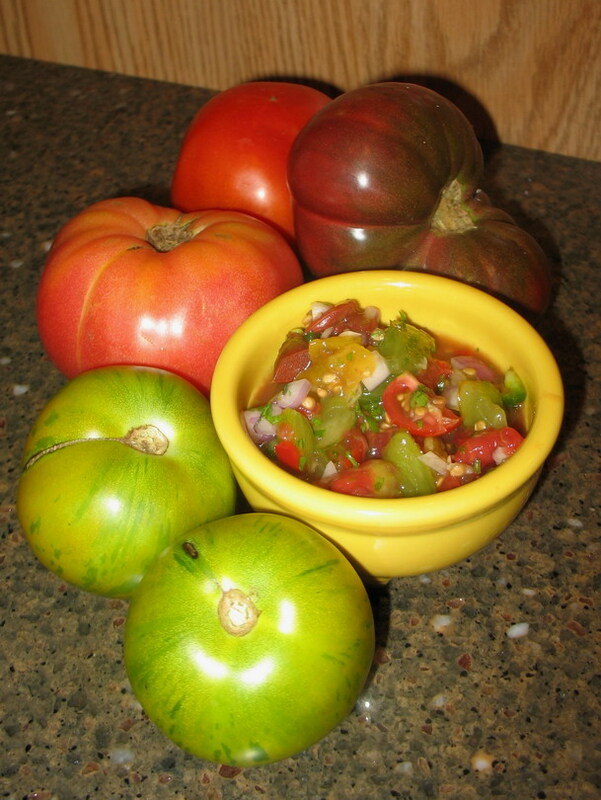 Yesterday, after picking up the tomatoes pictured above: Black Krim, Green Zebras, both Pink and Red Brandywines, and an unphotographed (but present in the pico de gallo in the yellow bowl) German Striped, I resolved to make a salsa similar to the Calico Salsa, but simpler. Instead of roasting some of the ingredients, then, I left them all raw and made what I am now calling Macaw Pico. Pico de Gallo is a raw Mexican salsa that is named for the beak of a rooster–this one, because of all of the colors of the vegetbles and fruits contained therein, I named after an even more colorfully plumed bird–the macaw. This has a less complex flavor than the Calico Salsa, but it is just as good. It is also a second entry into this month’s “The Spice is Right,” the theme of which is “Fresh and Local.” This recipe is almost completely local–the only non-local ingredients are the two limes and the salt. All of the rest: the chiles, the cilantro, the tomatoes the sweet peppers, the onions and garlic, were either purchased at the Athens Farmers’ Market or grown on my deck. Someday I might be cool enough to grow a lime tree indoors that bears fruit in Ohio, but until then, I will stick with the ones from Florida. Unlike their tomatoes, which are god-awful, their limes are awesome, and make a perfect counterpoint to the rich, sweet and tart flavors of my beloved heirloom tomatoes. Peel those tomatos which do not rely upon the skin of the tomato for beauty. For example, I peeled the “German Striped,” the flesh if which is yellow flamed with red throughout the fruit, while I left the peel of the green and yellow striped “Green Zebra” intact, because the interior color is solid kiwi green. I also peeled the Brandywines, which are solid throughout, but I left the peel on the “Black Krim” because it is so pretty with the burgundy shading into deep forest green. The flesh colors are similar, but not as vivid. Core all the tomatoes, and then dice them all into medium dice. Scrape into a mixing bowl, including as much juice as possible. Mix in all other ingredients, then salt to taste. I like to keep the salsa on the countertop at room temperature for a hour or two to let the flavors meld slightly; then I put it all up into a quart jar or container and put it in the fridge. It can last over a week in the fridge, if no one eats it all before then. It is great on chips, quesadillas, over scrambled eggs, mixed into chili, or used as a topping for a buritto or a taco. I hooked up with my coworker Erica, who is from Honduras, this last Saturday. I was shocked at how many vendors are now selling heirlooms. Last year there were two – now there were at least five. Erica, who had never seen such odd tomatoes before, bought two of every kind she could lay her hands on. She almost passed over the Green Zebras because she thought they were not ripe. I can’t wait to hear what she thought about all the different kinds when I see her at work today!! Wait to see if the Florida grown “UglyRipe” tomatoes get the OK to be shipped out of state. I’m stuck down here and it can be hard to tell if were getting gassed or local fruit. I usually buy mine from a stand rather than the grocery store. Better luck getting locals that way. They have been shipped out, Fred. I saw some a couple of weeks ago at the local grocery store. Ick. Hard as rocks. And no flavor. But the sticker said “UglyRipe” on it. Here I can get them at the local farmer’s market by the box if I wanted to spend that kind of money. If I wanted to eat that many tomatoes. Okay, well, I might want to eat that many, but it might not be a good idea…..
Rosie–let me know what Erica thinks of them! I had the same experience as Zak – I wouldn’t eat tomatoes at all until I had some gorgeous salsa, and now I can’t get enough of it. After this post I am dying to try local, vine ripened heirloom tomatoes as well. Sandra — check farmers’ markets starting in early spring, and you might find someone selling seedlings. If you feel more ambitious, start looking in late winter for seed-savers’ organizations in your local area; they can help you get seeds or learn how to save the seeds from a ripe fruit that you buy. I don’t trust a tomato if it’s perfectly shaped. I prefer it to be “ugly”. And I love the look of the tomatoes in your photograph, especially the darker one at the back! It drives me completely crazy that most of the locally grown field tomatoes (probably not heirloom tomatoes) are clearly picked green and ripened on the truck as they make the often less than an hour’s drive to Toronto to go onto the vegetable market shelves. I would LOVE to find a booth somewhere close by that sells ripe, vine ripened tomatoes that have been picked that day…. Sandra, Brenda had good advice. You can often find them at local nurseries and at local farmer’s markets in the springtime. Risingsun–Morganna was the same way. She didn’t eat fresh tomatoes until she had good salsa. Now, she eats fresh tomatoes in pasta, on sandwiches, and in salsa and salads. Oh, and in curries, too. We’re wondering over here at the NC — have you ever made fried green tomatoes? Hello, NC Posse! Why, yes, indeed I have–though, I have found you have to get good green tomatoes in order to fry them. The last ones I picked up for the purpose had no flavor and were absolutely a waste to fry. They should be very tart and crisp. So, taste before you fry. Here is the post from last year on the subject. This year, I intend on doing a second post with some Indian spices and maybe a green chile chutney to go with. Or, I might fry them in besan batter pakora style…you never know.